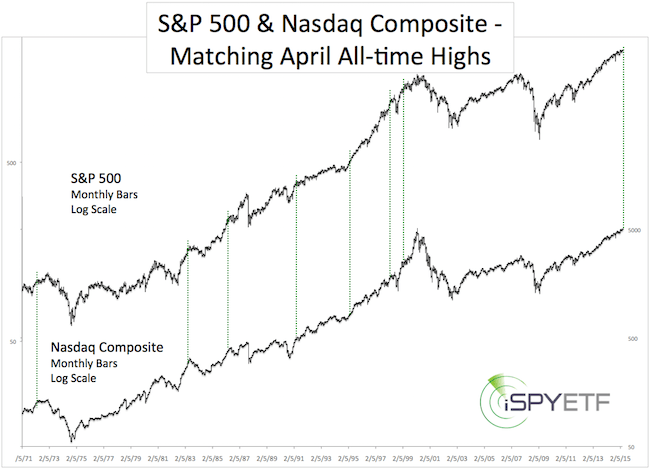 We observed on April 21, that the stock market was actually stronger than the S&P 500 (NYSEArca: SPY) chart led to believe (Article: Under the Hood is more Strength than the S&P 500 Chart Shows). Subsequently, the S&P 500 moved to a new all-time high on April 27 (2,126.92). However, this condition of underlying strength quickly morphed into underlying weakness. 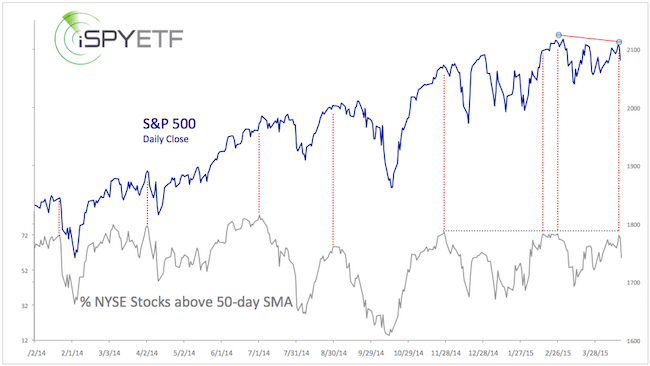 The chart below shows that bearish divergences between the S&P 500 and the percentage of NYSE stocks above their 50-day SMA tend to lead to weakness (only 2 out of 8 corrections since 2014 were not preceded by this divergence). AAPL spiked to a new all-time high on Tuesday (April 28) and has fallen 10 points since. 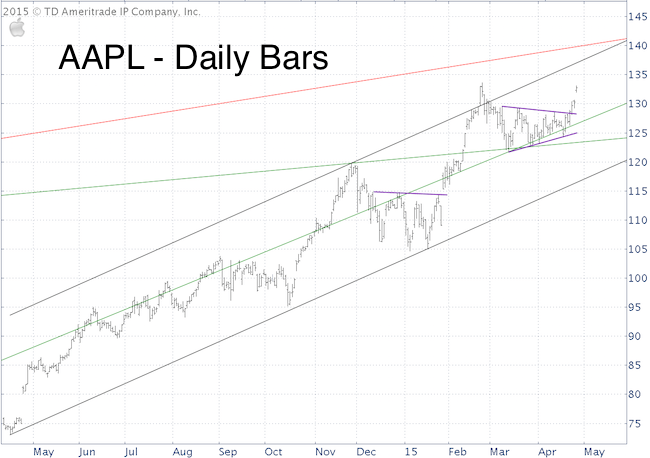 This week’s down side reversal of the S&P 500, Nasdaq and AAPL after a bullish breakout (according to technical analysis) emphasize why it is helpful to monitor multiple indicators. That’s why the Profit Radar Report looks at supply & demand, technical analysis, investor sentiment, seasonality and price patterns for a comprehensive outlook. The news-reporting powers to be have determined that rising interest rates are the bull market’s worst enemy. In fact, the looming threat of rising rates is as unwelcome as the dreaded QE taper used to be. But wait, QE ended many months ago, and stocks are still near their all-time high (see here for detailed analysis of QE effect on stocks). Could rising interest rates be a moot point (just like the end of QE was)? As we will see in a moment, rising rates are not as scary as many believe. But first off, how does the Federal Reserve raise interest rates and which interest rate is the one being ‘manipulated’? When the Federal Reserve (or the media) talks about raising (or lowering) interest rates, it is talking about the federal funds rate. The federal funds rate is the central interest rate in the U.S. financial system. It is the interest rate at which depository institutions trade balances held at the Federal Reserve with each other overnight. How Does the Fed ‘Manipulate’ the Interest Rate? The Federal Reserve sets the target rate. The target rate is currently 0 – 0.25%. The Fed ‘manipulates’ this rate via government bond purchases (i.e. the Federal Reserve reduces liquidity and raises the federal funds rate by selling government bonds). The actual rate is determined by trading between banks. The weighted average of bank transactions is considered the effective federal funds rate (currently 0.11%). But what really matters is how the federal funds rate affects stocks. The chart below plots the S&P 500 (NYSEArca: SPY) against the federal funds rate going back to 1954. Periods of rising interest rates are highlighted in green. More often than not, the S&P 500 moved higher (or didn’t decline significantly) when interest rates rose. The few exceptions are marked with a red box. Most recently, the S&P 500 rallied when rates were buoyed starting in 2004 and 1998. 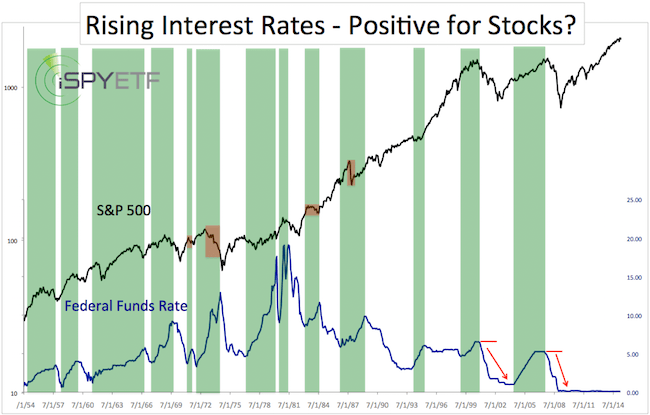 The green areas clearly show that rising rates are not bearish for stocks. However, it needs to be pointed out that when the stock market rolled over in 2000 and 2007, the Federal Reserve had a lot of room to lower rates and stimulate growth. That is not the case today. If this economic recovery does not stick, and stocks fall, the Federal Reserve won’t have much room to lower rates. It would take several rate hikes to build up a ‘cushion,’ that would allow the Fed to lower rates if the economy relapses. Perhaps that’s why the Federal Reserve has been so hesitant to raise rates, and thereby spook the market. Rather than focusing on rate hikes, I will continue to monitor the indicator that correctly foreshadowed the 1987, 2000 and 2007 market tops. 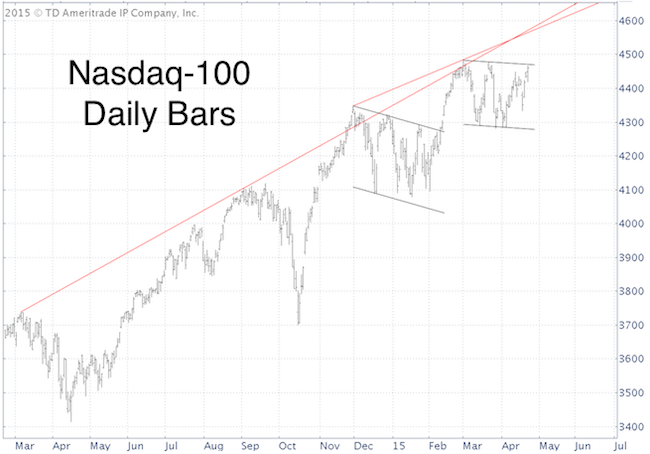 It also ‘told’ us consistently since 2010 that this bull market is alive and healthy. Here’s what this indicator, which I dubbed ‘secret sauce’ is telling us right now. Is the S&P 500 Carving Out a Major Market Top? High probability setups are like gold nuggets: rare and precious. What is a high probability setup? 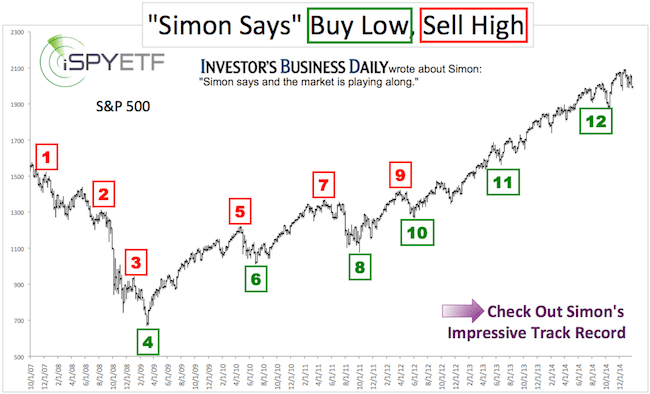 A high probability setup is a buy (or sell) signal with a high probability of being profitable. What makes it high probability? Investing (or trading) is all about putting the odds in your favor. The stronger the signal, the better the odds. Here is one recent example of a high probability setup. “The more research I do, the more attractive owning the Aussie dollar becomes. Seasonality is turning very bullish in April, cycles are up, sentiment is extreme, the latest low came with a bullish RSI divergence, and it broke above red trend line resistance. One way to gain exposure to the Australian dollar is via the CurrencyShares Australian Dollar ETF (NYSEArca: FXA). The first chart offers a long-term look at the Australian dollar and investor sentiment (commercial traders’ net futures position). 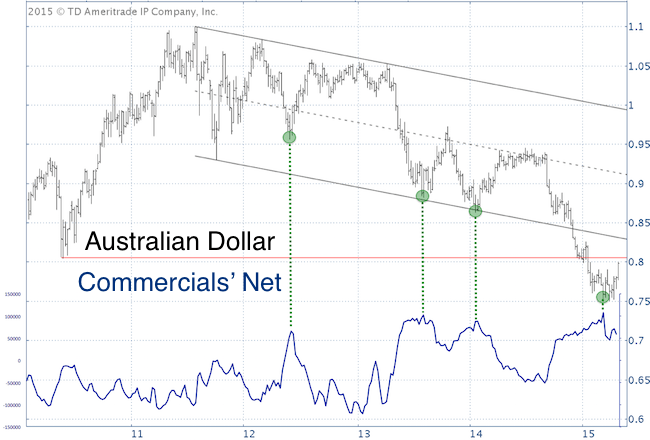 As the dashed green lines highlight, every time commercials’ net exposure soared, the Australian dollar started to rally. Seasonality projected a strong March – May rally. 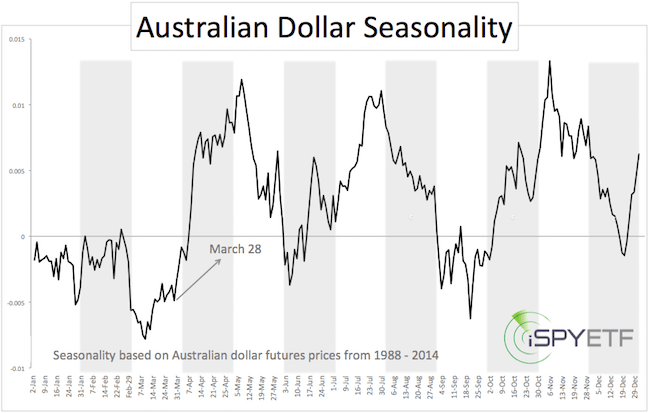 The Australian dollar seasonality chart is based on Australian dollar futures prices from 1988 – 2014. The daily performance of each year is weighted equally and averaged to attain seasonality, which reflects the average performance of the Aussie dollar based on 26 years of price history. On March 23 (green dot) the Aussie dollar broke above trend line resistance. There was also a bullish RSI divergence at every low in March or April. The Australian dollar did not rally immediately after the March 25 buy signal. In fact, it dropped at first. However, since seasonality and sentiment suggested higher prices, we stuck to our guns and held on. High probability setups deserve a ‘longer leash,’ because more often than not, trade moves in the expected direction. 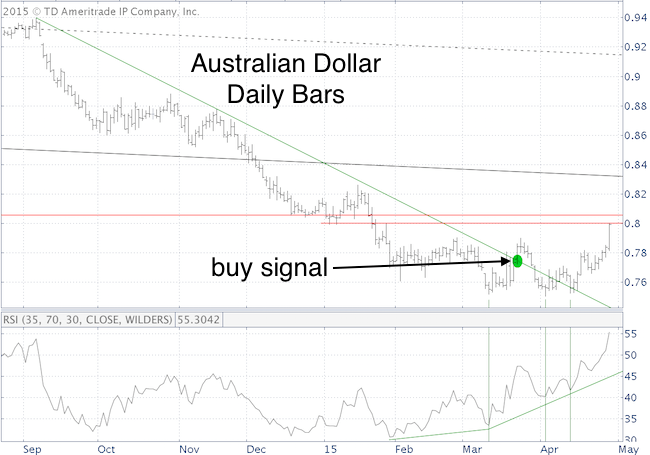 The Aussie dollar is up more than 3% since the buy signal, but has now reached long-term resistance and may pull back. RSI confirmed the latest high, so any pullback should be temporary. 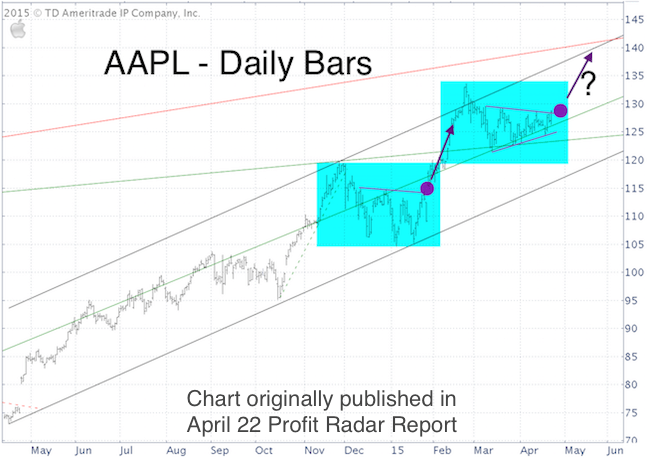 Below is an update AAPL chart. 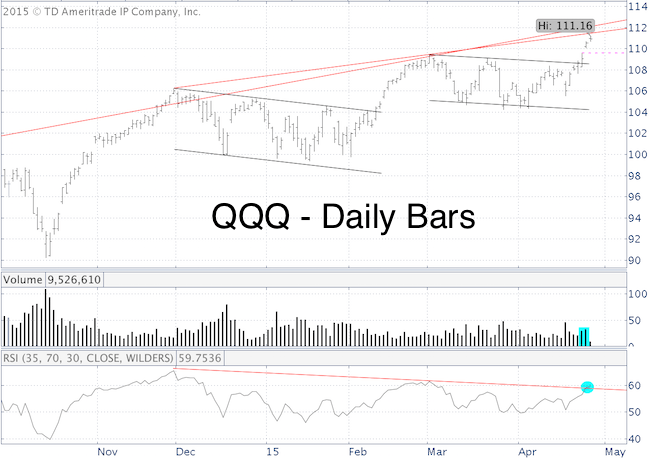 The next meaningful resistance cluster is around 140, but the open chart gap (and various breadth divergences) allows for a ‘digestive pullback’ at any time. In terms of Elliott Wave Theory, any new high could complete a 5-wave move and result in a larger-scale reversal. 15 years after the tech bubble, the Nasdaq Composite finally closed at a new all-time high. On the same day, the S&P 500 (NYSEArca: SPY) briefly spiked to a new intraday high. 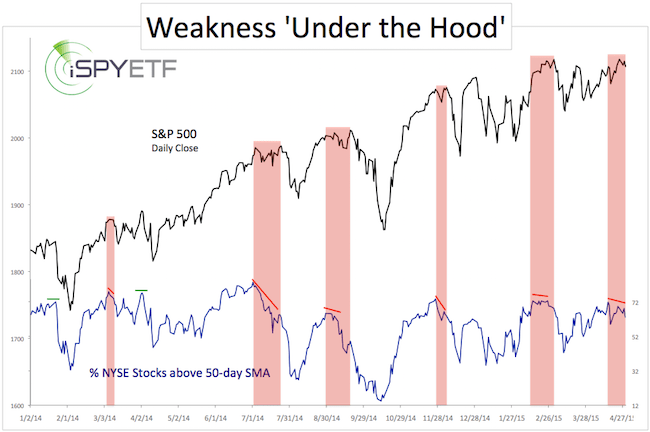 This is not surprising, since we just discussed that ‘Under the Hood is More Strength than the S&P 500 Chart Shows‘ (for how long remains to be seen). Let’s pretend for a moment the S&P also closed at an all-time high, and look at historic precedents when both indexes clocked in at new all-time highs on the same day. Since the infamous ‘sell in May, and go away’ period is almost upon us, let’s further narrow down our search to matching all-time highs scored in the month of April. The chart below does just that. The dashed green lines mark matching April highs. Things always get a bit tight when cramming 41 years of data into one chart; nevertheless, both indexes visibly struggled the months following matching April highs. The only exception was April 1995. Short-term, the S&P 500 broke above resistance (discussed here). Based on technical analysis, this is bullish. But other indicators suggest that up side could be limited. Why? More details here.